For your imbibing pleasure, we present the final two cocktails of the year. Both are made with your choice of sparkling wine: Cava, Champagne or Prosecco. Cava and Prosecco are less expensive and work just as well in mixed drinks. 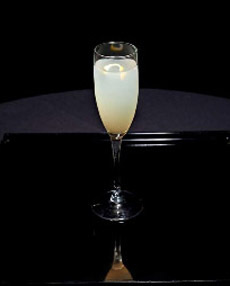 First, the Ginger Sparkler, created by New York City caterer Canard, Inc. 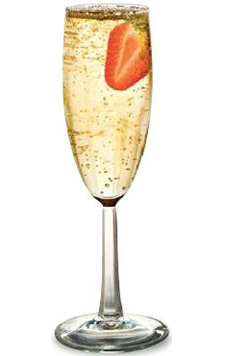 It combines vodka and ginger beer (a more intense predecessor of ginger ale) with Prosecco, and can be served year-round without the sparkling wine topper. Keep the ingredients well chilled. Top off a ginger cocktail with Prosecco or other sparkler. Photo courtesy Canard, Inc. | New York City. 1. GLASS. Combine the ingredients in a tall glass over ice. 2. FLUTE. Alternatively, you can serve the cocktail in a Champagne flute; be sure to chill the vodka, lime juice and ginger beer in advance. This photo doesn’t begin to capture the glamour of a St. Germain Champagne Cocktail—our favorite Champagne cocktail. St. Germain elderflower liqueur is one of the great food/beverage imports of the last 10 years. A liqueur made from Alpine elderflowers may sound strange, but it has the exquisite flavor of lychee—in fact, much more so than any lychee liqueur we’ve tried. Using one ounce rather than a half ounce of St. Germain elderflower liqueur makes the cocktail slightly sweeter. 1. POUR ingredients into a chilled fluted glass and stir lightly (you don’t want to burst the bubbles). 2. FLOAT half a strawberry or a whole raspberry as a garnish. 3. VARIATION: Experiment with other garnishes. A lemon or orange twist, a slice of fresh ginger, a blackberry or gooseberry. Browse through our cocktail recipes in our Cocktails & Spirits Section.